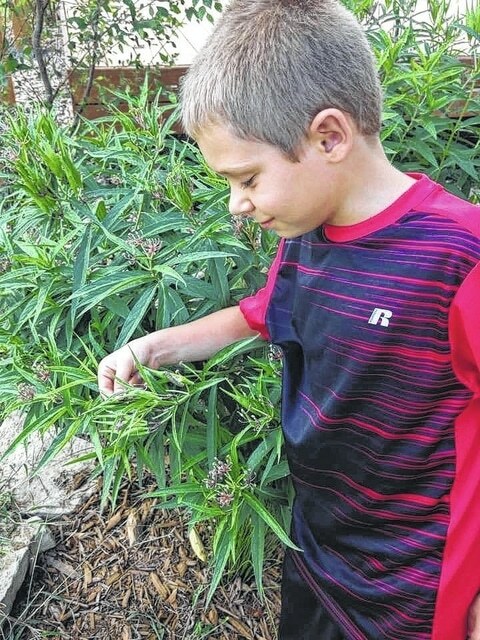 Logan Helfrich counting monarch caterpillars on a swamp milkweed plant. The Fayette Soil & Water Conservation District (Fayette SWCD) is holding its sixth-annual seedling tree and native plant sale. Members of the public have the opportunity to purchase tree seedlings at very reasonable prices. There are many reasons to plant trees. Bedsides being aesthetically pleasing, they protect our environment by filtering pollution from the air and soil, helping to recycle water, slowing water runoff, and preventing soil loss. They also improve our surroundings by creating shade, giving shelter from wind and rain, providing homes for animals, making food for humans and wildlife, and providing an interesting, soothing, learning environment for our children and community. Individual species are available in quantities of five, 25, or 100. The deadline for ordering is March 22. The trees are scheduled for pickup on April 13. Go to the Fayette SWCD Facebook page to download tree descriptions and order forms. For more information or to place an order, visit the Fayette SWCD office at 1415 US 22 SW, Suite 500, Washington Court House. https://www.recordherald.com/wp-content/uploads/sites/27/2017/02/web1_Logan-Helfrich-counting-monarch-caterpillars-on-a-swamp-milkweed-plant.jpgLogan Helfrich counting monarch caterpillars on a swamp milkweed plant.